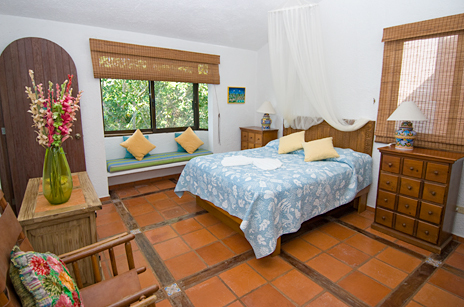 Kayaks on the beach at Casa Cielo are there for you to use; take them out for a tour of lovely South Akumal Bay! 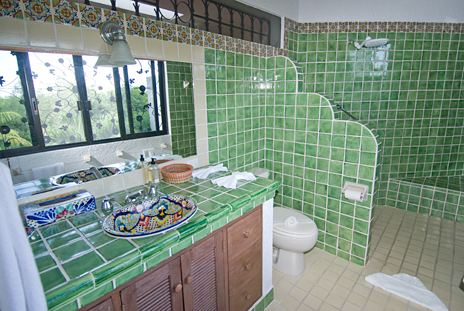 BR #1: First floor suite, 1 king, ocean view, private bath, patio, a.c.
BR #2: Second floor suite, 1 king, ocean view, private bath, a.c.
BR #3: Second floor, 1 queen, private bath, a.c.
BR #4: Second floor, 2 singles, private bath, a.c.
*Also: 1 Rollaway bed and crib available. 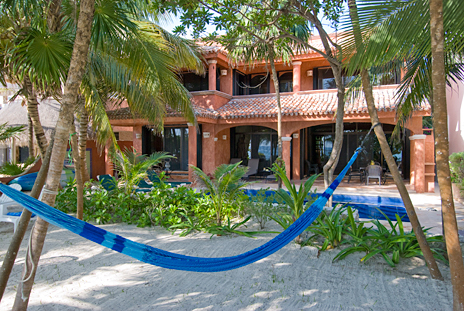 This vacation rental villa on South Akumal Bay is in very high demand because it has most requested features: sandy beach, 4 bedrooms, swimming pool, central air and plenty of space with tasteful decorating. 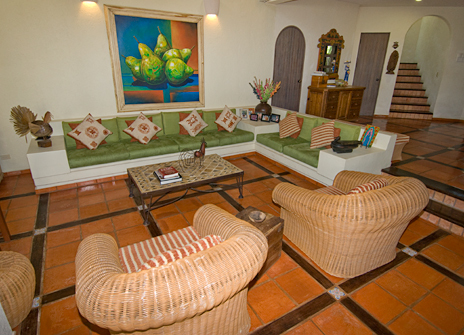 Construction is of finest quality with attention to details and many extras as specified by the owners. 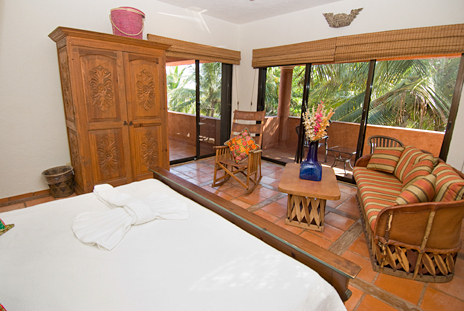 Warm, earthy colors are used throughout the Casa del Cielo beachfront villa for a very rich feeling. 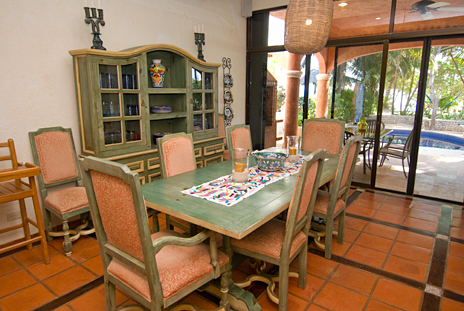 Shades of rust, clay and cream have been combined with green and brown for a pleasing affect. 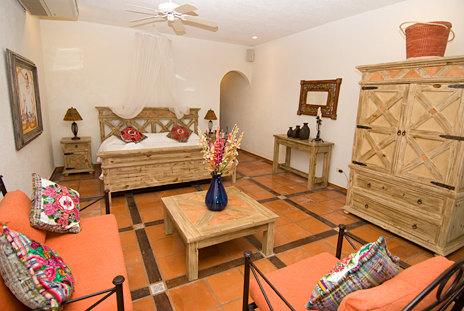 Casa Cielo has a strong and earthy personality and you'll immediately feel at home in this comfortable vacation property. 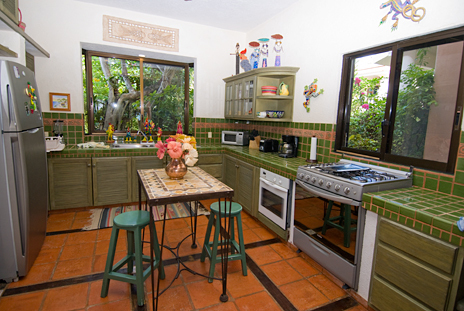 Living room, dining room, kitchen are open and spacious with plenty of light. Dining area has seating for 8 plus additional seating at the lunch counter. 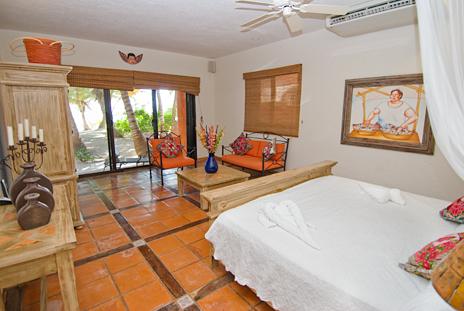 And look what's right out your door: Don't you wish that you could slip out the sliding glass doors from the living area to your private patio, beach and pool area every single day of the year? 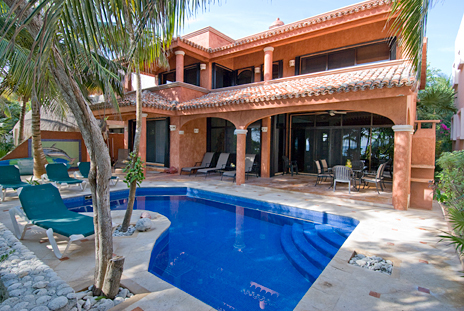 Savor every moment in this tropical paradise! But book it early because this one is a favorite for many. 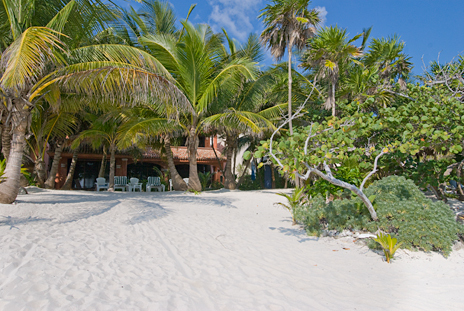 Tropical palms provide patches of shade along the sandy beach. You'll spend lots of time at the oceanside pool and patio (which, by the way, has a barbecue grill). Stroll along the beach or built a sand sculpture on the shore. Make a sand angel and let the waves wash it away. Of course you'll want to take one of the sea kayaks out for a tour of South Akumal Bay! 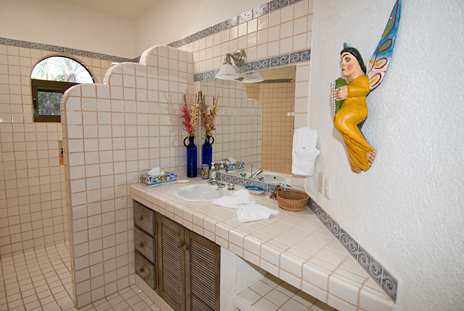 One of the master suites is on the first level, with large walk in closet, glass doors to the patio area, and large private bath with tub and shower. 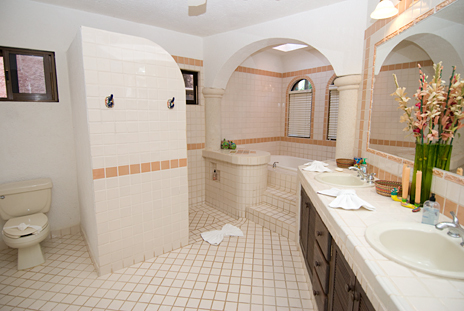 Another master suite is on the second floor and has large closet, private bath. 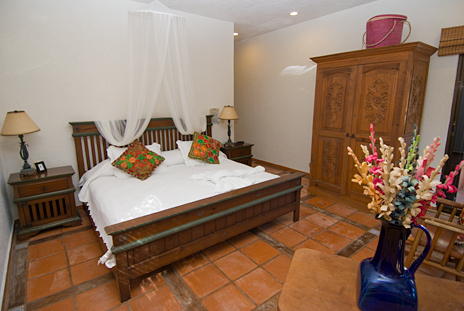 There are two other bedrooms on the second floor, each with a private bath. 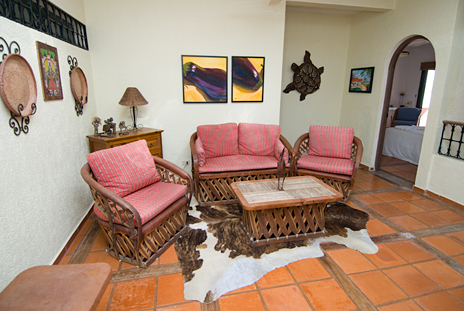 A studio area on the second level overlooks the living area and has satellite TV. 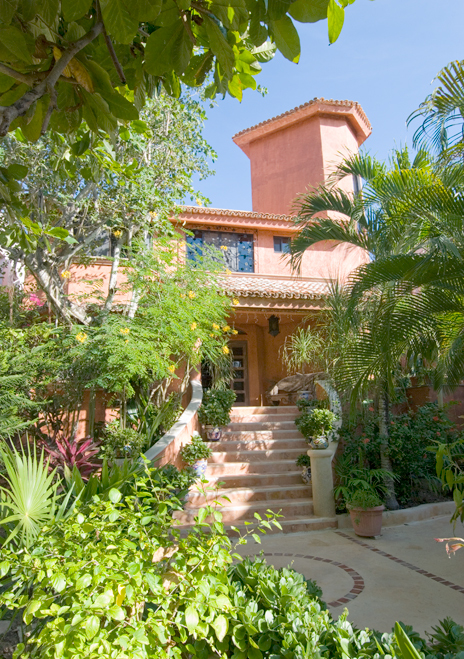 From this area a stairway leads to third level rooftop observation area where you'll have extraordinary views of the Caribbean and the inland jungle. 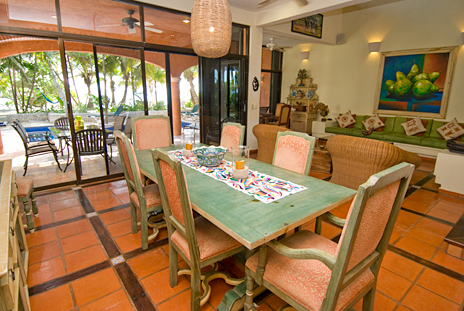 Enjoy the gentle ocean breeze and warm sunshine. This rooftop observation area puts you a little bit closer to heaven. See if you don't think the stars are brighter here! 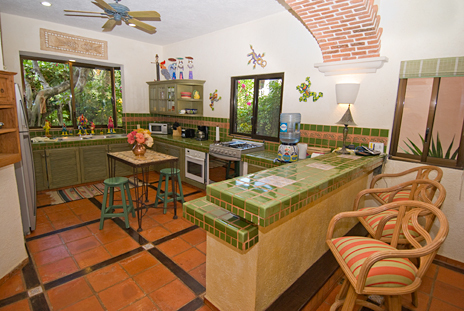 The Casa de Cielo vacation villa will indeed provide a heavenly vacation experience. 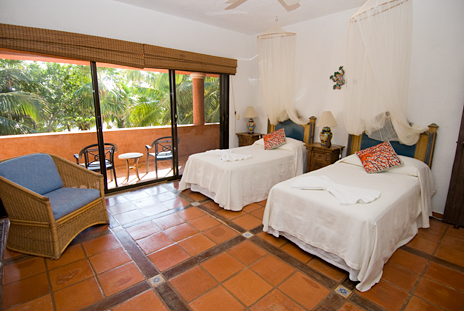 BR #3, 2nd Floor: Two twins, patio doors to balcony, private bath, a.c.
BR #4, 2nd Floor: Queen bed, private bath, a.c.